Sharing a tool I use to browse images of the Civil Birth, Marriage and Death registers on the IrishGenealogy website. The tool adds a selection of next / previous links to make it easier to move backwards and forwards through the images without having to manually edit the URL. This can be useful to help locate mis-indexed entries, or records with missing index entries. Open the BMD Image Browse Tool, paste in the copied URL, and click the submit button. The Next and Previous buttons move one page forward or backward through the register images. Also available are +-5, +-10 and +-50 links which skip backward or forward in larger steps. To start a new search, click the [reset] link to the top right. If the captcha screen is displayed instead of a register image, select the appropriate images and enter your name as usual and the register image will display. The full references with page numbers are available on the FamilySearch version of the BMD Index. These are also available on FindMyPast and Ancestry. The tool was primarily developed for Chrome and also tested on FireFox, and on Safari on iPad, but should also function on other modern browsers. See also the revised 1901-1911 Census image browse tool and the new Tithe Applotment Image Browse (updated Jan. 2018). For records on IrishGenealogy without an image link, or where the image is in the wrong volume or district, I start off by establishing the full index references, i.e. the year/quarter, volume and page using the BMD Index on FamilySearch (or FindMyPast/Ancestry), and then look for other records in the same year/quarter, registration district and volume, ideally with a close page number, ideally with nice unusual names and start the browse with these..
An additional source that can help provide clues is the collection of extracted civil records on FamilySearch, i.e. births(*), marriages and deaths, these include partial details on the records and some include a page number as part of the ‘address’ field – e.g. “..539, Maynooth, Kildare” some records include details under a ‘Reference Id’ in the expandable panel to the right – e.g. “p508 ln233” , This collection includes transcript on many (but not all) births marriages & deaths between the start of civil records and about 1881. St. Patrick’s Cathedral was founded in 1190 on the site of a chapel erected by St. Patrick; but it was not till 1370 that the first stone of the present edifice was laid This cathedral is of Gothic architecture, and is surmounted by a steeple and spire, the summit of which is 223 feet from the ground. The nave is 130 feet long, and is illumined by one large window at the West end ; it contains, amongst other monuments, those of the following remarkable persons: Archbishops Smyth, Marsh, Talbot, and Tregury; Bishop Meredyth, Dean Keating ; Dean Swift, who was interred Oct. 22, 1745; Mrs. Hester Johnson, well known as Swift’s Stella; Richard Lambert, Earl of Cavan; John Ball, serjeant-at-law; Richard Parsons, Earl of Rosse; and A. McGee, a servant of Dean Swift. The Organ, which is the finest-toned in Ireland, was built at Rotterdam, and given to the Cathedral by the Duke of Ormond, who took it from the Spaniards at Vigo. The Choir is extremely beautiful, and has an arched ceiling of stucco which has replaced the ancient stone roof. It contains the stalls of the Knights of St. Patrick, together with their helmets, swords, banners, Amongst the monuments with which it is adorned, are those of Richard Boyle, Earl of Corke, and Catherine his wife; Elizabeth, Viscountess Doneraile; the Duke of Schomberg, who was killed at the Boyne; Dr. Byttolph, Dean of Raphoe and Chaplain to Charles L; and Arch-bishop Jones. The Chapter House contains a statue of the Marquess of Buckingham; and here also is preserved the skull of the Duke of Schomberg. In the Dean’s House in Kevin Street are portraits of all the Deans of St. Patrick’s. The Archiepiscopal Palace has been transformed into Barracks for the Police. Near the Cathedral is Archbishop Marsh’s Library, which is open to the public. It contains the books of Dr. Stillingfleet and some curious MSS. Christ-Church Cathedral, formerly dedicated to the Blessed Trinity, was erected in 1038, on the site of a range of vaults, in which St. Patrick first preached to the people of Dublin. The present choir, however, was not built till 1658. This Cathedral is situated near the centre of Dublin, not far from the Castle. The exterior is in the Gothic style, but so dilapidated and disfigured by buttresses, that little of its original beauty remains. The Nave is 103 feet long, and contains several monuments, particularly those of Thomas Prior, a zealous promoter of the manufactures of Ireland; Earl Strongbow, the first invader of Ireland, who died 1177; Lord Chancellor Bowes, who died in 1767 ; Lord Chancellor Lifford, buried in 1789; and Dr. Welbore Ellis, Bishop of Meath. The Transept is 90 feet in length, and is principally of Saxon architecture. The Choir is 104 feet by 28, and exhibits an incongruous mixture of several styles of architecture : it contains monuments in memory of Robert, Earl of Kildare, Bishop Fletcher, and Dr. Woodward. In one of the aisles are statues of Charles II. and James II. Contiguous to the Cathedral is St. Mary’s Chapel, belonging to the Dean and Chapter. St. Andrew’s, or the Round Church, contiguous to Dame Street, was built in 1793. It is of an elliptical form, and measures 80 feet by 60. Over the entrance in St. Andrew’s Street is a statue of the saint by E. Smyth, and in the churchyard is an unfinished steeple, in the Gothic style, designed by Mr. Johnston. The interior is light and elegant, and the capitals of the columns supporting ‘the gallery are very beautiful. In the centre is a well. executed font, of veined marble; and over it hangs a lustre which formerly belonged to the Irish House of Commons. St. George’s Church, in Hardwicke Place at the N. extremity of Dublin, is a very handsome modern edifice, erected from designs by Mr. Johnston. The principal ‘front is 92 feet in width, and consists of a noble portico of four fluted Ionic columns, the ascent to which is formed by a flight of steps 42 feet wide. Above it rises the steeple, a beautiful specimen of architecture, 200 feet in height. The body of the church forms a square, having three fronts of the Ionic order. At the eastern extremity are the parish school and vestry-room. St. Werburgh’s Church, in Werburgh Street, is a large and elegant structure, erected in 1759, on the site of the original building, dedicated to the sainted daughter of Wulherus, king of Mercia. The front consists of several stories, the basement being Ionic, the second story Corinthian, and the third Composite. The spire by which it was formerly surmounted was taken down in 1810. In this church, Sir James Were the antiquary, Edwin the performer, and the unfortunate and misguided Lord Edward Fitzgerald, were interred. St. Michan’s Church is situated in Church Street, on the N. side of the Liffey. The body of the building is cruciform, and very ancient; but the steeple is more modern. Near the altar is an antique figure of a man in armour, but of whom is unknown. The vaults beneath this church are dry, and are remarkable for preserving bodies almost unaltered for a great many years. Some, that have been here centuries, still retain their features. In the churchyard is the monument of Dr. Lucas, who represented Dublin in Parliament, and died in 1771. St. Peter’s, in Aungier Street, is the largest parish church in the city, and is noted as that in which the celebrated Dean Kirwan preached. Mr. Maturin, the author of Bartram, was a curate of this parish. St. Thomas’s Church, opposite Gloucester Street, is an elegant structure, erected in 1758 from a design by Palladio. The interior is commodious and well designed. The other Churches of Dublin present nothing worthy of particular attention. Dublin contains numerous places of worship in which service is performed according to the rites of the Romish Church; but the following are the only ones entitled to notice. The Metropolitan Roman Catholic Chapel, situated in Marlborough Street near Sackville Street, is a magnificent building in the Grecian style, the erection of which was begun in 1816. It is surmounted by a dome, and adorned with a noble portico, consisting of six columns of the Doric Order. Anne Street Chapel is a handsome stone edifice in the pointed style. Over the grand altar is an alto-relieve, representing our Saviour; and on the side altars are Paintings of St. Francis and the Virgin. Exchange Street Chapel is an elegant modern building, in the pointed style, having two beautiful fronts of hewn stone. The interior is chaste, though richly ornamented. Over the altar is a painting of the Crucifixion, and on either side are windows of stained glass. The two smaller altars are adorned with paintings; one representing St. John the Evangelist, by Del Frate ; and the other Michael and Satan, copied from Raphael. On one side of the chapel is a monument in memory of Dr. Beatagh, executed by Turnerelli. The confessionals are very beautifully carved. The places of worship in Dublin belonging to the Dissenters are numerous, but none of them are remarkable as buildings. The Presbyterians have Meeting Houses in Strand Street, Mary’s Abbey, Eustace Street, and Usher’s Quay; the Independents in Plunket Street, Hawkins Street, and King‘s Inn Street; the Methodists in Mountjoy Square, Great Charles Street, Great George Street, Abbey Street, Cork Street, Kendrick Street, and Whitefriars Street ; the Baptists in Swift’s Alley; the Moravians in Bishop Street; the Quakers in Meath Street and Sycamore Alley. There are also various other places of worship of minor importance. The Royal Hospital at Kilmainham was erected in 1683, from designs by Sir C. Wren, for the reception of invalid and superannuated soldiers. It is well adapted for the purpose, and generally contains about 300 men. In the hall, which is 100 feet long and 50 broad, are about twenty portraits and a collection of arms. The Chapel is a venerable building, 80 feet by 40: the E. window is adorned with painted glass, and beneath it is the communion. table, of carved Irish oak. The Blue-Coat Hospital, in Blackall Street, was founded in 1670, for the maintenance and education of the sons of unfortunate freemen. The present hospital was erected in 1773, and is a noble edifice of Portland stone, consisting of a centre and wings extending 300 feet. It is capable of accommodating from 150 to 200 boys. The Lying-in Hospital, in Great Britain Street, was founded by Dr. Mosse, and was opened for the reception of patients in 1757. It is a handsome building, erected from designs by Mr. Cassels. The Chapel is much admired. The Foundling Hospital, at the end of Thomas Street, for the reception of destitute orphans and deserted infants, was founded in 1704, and annually admits about 1900 children. The House of Industry, in Brunswick Street, is an extensive range of building, generally containing about 1700 persons, whom age or sickness have rendered incapable of earning subsistence. St. Patrick’s, or Swift’s Hospital for Idiots and Lunatics, was founded in 1745 by Dean Swift, who bequeathed it £11,000. It will contain about 180 patients. The Mendicity House, in Copper Alley, was established in l818, for the purpose of clearing the streets of Dublin of the numerous beggars with which they were infested; an object which has been in a great measure accomplished. The County of Dublin, or Meath Hospital, at the bank of Kevin Street. The Fever Hospital, or House of Recovery, in Cork Street. Sir Patrick Dun’s Hospital, Grand Canal Street. The Hibernian Marine School, on Sir John Rogerson’s Quay. The Dublin General Dispensary, in Fleet Street. The Charter School at Clontarf. The Hospital for Incurables, Donnybrook Road. Mercer's Hospital, in Stephen Street. The Bethesda Lock Penitentiary, Dorset Street. The Westmoreland Lock Hospital, Townsend Street. Simpson’s Hospital, for the Blind, in Great Britain Street. Stephens’s Hospital, in James Street. Nicholas’ Hospital, in Francis Street. The Molyneaux Asylum, in Peter Street, for Blind Females. The Infirmary, in Jervis Street. The Orphan House, in Prussia Street. The Female Orphan House, in the North Circular Road. Carlisle Bridge, connecting Westmoreland and Sackville Streets, is a. handsome stone edifice of three arches, erected in 1791. It is 210 feet long and 40 broad. The view from this bridge is truly beautiful. The Cast Iron Bridge between Carlisle and Essex Bridges, is a single arch 140 feet in the span, resting on stone buttresses. Essex Bridge, crossing the river from Parliament Street to Capel Street, was originally erected in 1676, but rebuilt in 1755 on the plan of Westminster Bridge. Richmond Bridge, connecting Wine-Tavern Street with King’s-Inn Quay, was built in 1816 from designs by Mr. Savage. It consists of three stone arches, the centres of which are adorned with representations of Commerce, Hibernia, and Peace, on one side, and Plenty, the Liffey, and Industry, on the other. Whitworth Bridge was commenced in 1816 on the site of the Old Bridge, which was the oldest in the City. It resembles Richmond Bridge, and connects the extremities of Merchants’ and King’s-Inn Quays. Queen’s Bridge, connecting Bridge-root Street and Queen Street, is 140 feet long and 40 broad. It consists of three stone arches, erected in 1764 on the site of Arran Bridge. Bloody, or Barrack Bridge, is the oldest in Dublin, and is situated near the Royal Barracks. 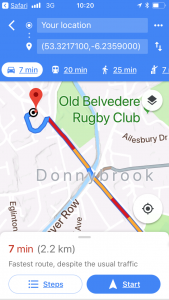 It is called Bloody in consequence of a fatal encounter which occurred in 1671 between the Military and some Dublin apprentices, who wished to demolish a bridge near the Barracks. Sarah’s Bridge, or Sarah’s Arch, at Island Bridge, about a mile from the city, is so called from Sarah, Countess of Westmoreland, who laid the first stone in 1791. It is a beautiful structure, consisting of one stone arch 104 feet in the span. 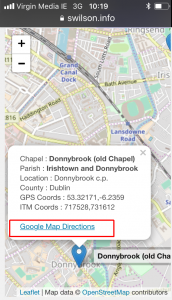 The Tithe Location Reference database was created to help try to work around a number of location errors included in the Tithe Applotment transcripts on the National Archives of Ireland website. There are a number different types of error, the most common being those combining two or more consecutive parishes, some with the same or similar name – e.g. Donaghmore Co. Limerick and Donaghmore Queen’s County, or a following parish alphabetically – e.g. Brannocktown Co Kildare and Bray Co. Wicklow, Grangegorman Co. Dublin and Grangemaccomb Co. Kilkenny etc. Some of the other errors seem to be due to misinterpreting the Diocese as the County – e.g. Meath or Dublin, and yet further errors do not seem to have any logical reason – e.g. Allsaints parish , Donegal is indexed under Co. Dublin. There are two basic modes of operation for the Tithe Location Database , the initial being the Tithe Parish on the left and the associated Civil Parish on the right. This shows the Counties and Parishes based on the way they have been transcribed on the NAI system, so can be used to check which Civil Parish is actually associated with the Parish. Select the required County, and optionally part of the Tithe parish name – e.g. selecting County Dublin shows the following. Any issues are highlighted and include notes – e.g. Allsaints noted as ‘Location Error‘ and in Co. Donegal, same with Balla in Co.Mayo. The Tithe parish of Ballyfermot is shows as a mix of parishes i.e. Ballyfermot and Palmerstown. 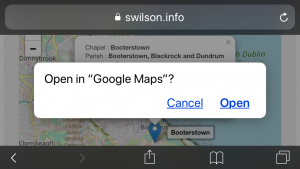 The link in the 3rd column is to the associated NAI Transcript page and if for those with a camera icon in the last column link directory to the image page for the correct civil parish using the IrelandGen Tithe Image Browse Tool. 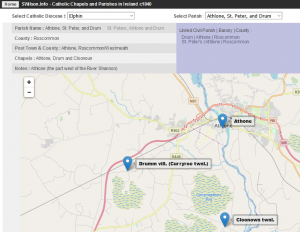 The second mode available for the Tithe Location database is the reverse – Civil Parish to NAI Tithe Parish, which can be used to check if the selected Civil Parish has been transcribed, and if it has been which Tithe Parish it is listed under. To select this mode click the < Switch > link below the county dropdown. On the sample of Co. Wicklow Civil parishes above see that Ballykine Civil parish does not appear to have been included in the current Tithe Transcripts and displays as ‘no link found‘ , and entries for Bray Civil Parish have been mixed with those for Brannockstown Co. Kildare. The Camera icon links directly to the images of he correct Bray Applotment books(*), and the Tithe Link icon on the far right links to the NAI transcript for Brannckstown – the transcripts being a mix of the two parishes. A batch of Applotment Books between Drung and Duncormick alphabetically appear to have been omitted from the FamilySearch films used for this project so not included in either the images or transcripts. * Some of the townlands of Bray Civil Parish listed in later sources, e.g. Griffith’s the Townland Index etc, are included in Powerscourt Tithe parish. p.s. many thanks to those who have provided additional corrections to include in this system. Added a new beta version of a Historic (c1845) Coastguard Station Map browse by port to my website, which uses OpenStreetMaps and leaflet. see : Maps of Coastguard Stations by port. a link to these maps has also been added to the existing ‘Coastguard Stations in Ireland c1845‘ page.